Sneaky here with another pawsome interview of a pet character. 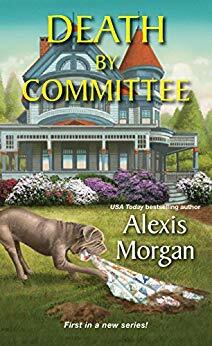 Today, it’s my pleasure to chat with a cozy mystery dog whose current book, Death by Committee, is on tour with Escape with Dollycas Into a Good Book. Meow there.. What is your name and your author’s name? My name is Zeke, and my author’s name is Alexis Morgan. Tails wags to you, Zeke. What book(s) have you appeared in? Please list them and their genre. The first book I’m appearing in is a cozy mystery entitled DEATH BY COMMITTEE. 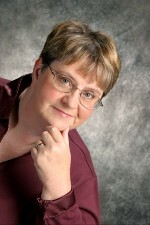 DEATH BY COMMITTEE is the first book in The Abby McCree mysteries. Abby recently moved to Snowberry Creek, WA, to live in the house she inherited from her Aunt Sybil. She inherited me as well as her aunt’s tenant, who lives in a small house on the back of the property. Sounds pawsome. I love to interview pet characters with debut series. Are you based on a real dog such as your author’s? If so, please give further details. My author has two granddogs she adores. One is an English Bulldog and the other is an Olde English Bulldogge, each of which weighs about fifty pounds. As a result, she has a special fondness for dogs with jowls and a tendency to both drool and snore (often at the same time.) She combined the best of both dogs’ characteristics (and their weight) to create me. I’m a mastiff mix who weighs about ninety-five pounds. Wow, Meow! That’s big. The co-star in my Cobble cove series is a Golden Retriever, but Fido doesn’t weigh quite that much but a lot more than me, of claws. Coincidentally, my author Debbie has two new grandkittens. I’m sure they will show up in one of her books soon. I’m based on her senior Siamese who passed away last year, but I’m not exactly his duplicate. Here’s a scene when I was the one who sounded the alarm when Abby was danger. Although I really wanted to go after the person who threatened her, she insisted I stay with her. I didn’t argue too much, because comforting her was also important. The sharp stab of Zeke’s teeth on her arm was too real to be a dream. It stung a little, but that didn’t mean Abby was ready to wake up. Then he barked right in her face, blasting her with peanut-scented doggy breath. Her eyes popped open, or at least she thought they had. It was hard to tell if the room was dark or if she was still trapped in a dream. Zeke’s growl definitely sounded real enough. Something had him upset, and that something that had him in full-on protection mode. Like he could actually answer questions. There was only one way to find out. Night had fallen big time, so it was too dark to see much of anything. Before she could stand up to get a better look, the window behind her chair shattered and sent her diving for the floor. Landing hard on shards of glass hurt like crazy, but she needed to get out of the line of fire. Zeke went crazy, barking and scrambling to reach the window. She ignored the pain in her hands and knees as she made a grab for his collar. If he tried to jump through the broken window, he could get badly hurt. Even if he succeeded without mishap, he’d be in danger from whoever had just lobbed something through her front window. It was hard to crawl while dragging an angry dog in her wake, but she managed to reach the relative shelter of the hallway. Once there, she risked standing up and then bolted the rest of the way to where she’d left her cell phone on the counter. Who should she call first? The police or Tripp? The decision was made for her when the man in question suddenly appeared on the back porch as if she conjured him out of thin air. How had he gotten there so fast? Had the sound of the glass breaking carried all the way to his house? Either she trusted him or she didn’t. Her hands were shaking badly enough that she had trouble turning the lock, but finally she managed it. As soon as the door swung open, he charged inside. You are quite the actor, Zeke. Thanks for that doggone great tidbit. I’ve never shared the details of my early life with Abby, but she knows it wasn’t pretty. I love being part of a good pack now, even if the other members are both humans. Abby and Tripp, the man who rents the small house in the backyard, take good care of me. They’re both soft touches when it comes to giving me treats. In return, I keep them company, make sure they get plenty of exercise, and do my best to keep them safe. Protecting your protagonists is the main duty of all pet characters. I also make sure Alicia and her friends and family are safe in Cobble Cove. Do you talk in your books or remain silent like I do who just meows occasionally? I mostly communicate by barking and slobbery licks. When Abby seems to need comfort, I let her know I’m there for her by either laying my head in her lap or curling up next to her on the bed. I also use body language, cat sounds, and clues to get attention in my series. Keep a close eye on your humans at all times. It’s amazing how much trouble they can get themselves into. Who knows how bad it would get if we weren’t there to save them! Purrfect advice, and I think it applies to all pets characters especially those in cozy mysteries. DEATH BY COMMITTEE came out on January 29th. The second book in the series, DEATH BY JACK-O’-LANTERN will be out in the fall of 2019. The third book will be released in the summer of 2020. Condogalations on your new release and upcoming books! It’s been great having you here, Zeke. I’m sharing you and your author’s blog tour information below. Best tail wags to you both. Hi, Sneaky! Thank you so much for interviewing Zeke today to get his take on his life with Abby in Snowberry Creek! You’re welcome, Alexis. Good luck to you and Zeke on your new release and blog tour.